Human resource management is one of the key success indicators adopted by leading global organizations. It drives business and society forward, propelling them towards achieving sustainable development goals. It serves as an additional topic to be considered, supplementing fundamental topic, i.e. workforce planning commensurate to business’ growth, increasing work capacity to maximize employment value. CP ALL Plc. and its Subsidiaries (“the Company”) have distinctive visions and the courage to take actions. These factors distinguish the Company, enabling concrete success. The Company’s effort to identify management opportunity highlights human resource management. The Company prioritizes employee capacity development, as reflected through outpouring financial investment. All employees are the Company’s pride. The Company have successfully fostered “good, smart people, who are forward-thinking, and collaborative.” Thus, human resource management opportunity is interconnected to conceptualization of internal engagement, serving as a factor inaugurating the Company as Thailand’s leading retailer. Social contexts are changing in many forms, through digital media or IT communications. They gradually become part of a daily life. These changes permeate activities and lifestyles across all generations, from product and service purchases to large industrial production processes. These changes affect values, professional attitudes, and demand. Workforce is not implored to be apt with modern working skill. These skill sets determine how well an organization can address imminent changes and challenges. Subsequently, the Company recognizes the importance in instantaneously develop human resource capacity. Employees must have readiness. The Company’s approach constitutes collaboration with academic institutions. Such collaboration is often on skill training and professional readiness preparation, designed for university students and any interested individuals. Promote diversity by announcing a policy on diversity management and acceptance. The policy is related to Human Rights and Labour Practice Policy. It comprises of 5 components, which are 1) readiness for others’ differing opinions, 2) promote and stimulate sharing of constructive opinions, 3) enhance working culture to be respectful and harmonious, in regards to diversity, 4) equal treatment throughout the process, both in terms of selection, development opportunity, and professional growth, and 5) rewarding employees’ good performance. The policy aims to combine differences, open up the space for differing opinions, solidifying employee satisfaction. The Company gives all employee equal access to capacity development, as well as opportunities for professional development. Each of the 3 work units has their respective standard programs, comprises branch store unit, product distribution unit, and office unit. The program’s content has been commensurate to suit all-level individuals, from operational, management, to executives. 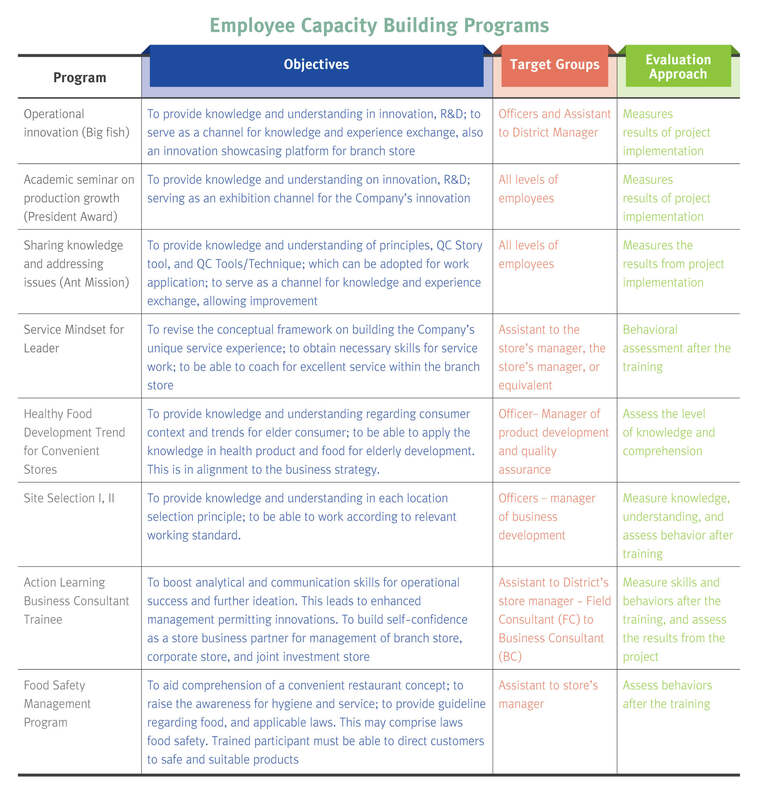 The aforementioned programs are part of the annual employee development plan. They grant employee knowledge training for their position and level, simultaneously maintain consistency with respective plausible professional path. The Company has conducted surveys exploring what skills employees are most interested in. Employee assessment’s results, conducted by the work lead, is consequentially utilized to facilitate program design and development. It enables training programs to be consistent and appropriate to the profession. The programs are conceptualized with full considerations to the Company’s values, and equilibrium needs between both the employees and the Company. The Company analysed the results, categorizing it according to the employees’ age range. This allows identification of a specific issue that interests each age range. The results show that Generation Y employees, the Company’s new driving force, are interested in being exposed to various learning opportunities; in addition to regular full-time work. The Company uses the survey results to devise human resource working plan. Branch Store Program comprises of the standard program for store employees, the standard program for the store’s assistant manager, the standard program for store’s manager, the standard program for assistant to district manager, and the standard program for district manager. Product Distribution Program comprises of a fundamental program on stock inventory, a fundamental program on product increase, a knowledge-based program for work lead, a program on coaching technique and trainings during operations, and a standard program for the unit head. Office Program comprises of fundamental program on the organization, a program on communication and facilitation skills, Service Excellence program, a program on concepts for work quality improvement, a program on mindfulness and efficiency increase at work, a fundamental preparation program for work lead, Service Plus program, a program on coaching technique, a program on advising technique, a standard program on modern work lead, a program for mindfulness and value enhancement in work lead, a fundamental preparation program at an executive level, service management program, effective meeting program, effective communication program, modern management program, advanced management program, wisdom exploration I & II program, master of advanced management program, reflective conversation, to coaching program. Furthermore, the Company also promotes development of necessary knowledge and skill for employees nearing retirement. There would be seminars conducted annually. These seminars expound privileges and benefits retirees are entitled to from the public and private sector. There are also activities providing information on financial planning in preparation to retirement, to name a few. Employees, who has been at the Company for a sufficiently long time, will be entitled to participate in Employee Joint Investment Program: EJIP, including a discount for service fees at 7-Eleven stores. This discount is only applicable for participating employees. Said employees can also pay loans without interests. Presently, employees and employees nearing retirement are actively involved in joint investment program of 7-Eleven store. As many as 1,242 branches have been founded. This arrangement fortifies good engagement between employees and the Company’s business. It also aids in employee retention, subsequently their expertise in branch store management and retail business. The program provides an incentive for employees to continue working with the Company. The project has been in continuous operation since 2016. It focuses on extirpating generation gaps amongst employees. The project’s aim to enable different generations to work harmoniously in the most effective manner, and jointly-creating great results. The Company has established a joint committee, comprises of representatives from all employees’ age range. High level executives from each work unit also actively take part. The Committee communicates and drives forward this key message to all employees. In 2017, One Way would be the crux of all communication, bolstering employees’ awareness and recognition of Our Way, and subsequently, its role in contributing to even greater Company’s results. Adherence to Our Way allows employees to be ‘Open minded, adaptive, and changed. We use Aon Hewitt Employee Engagement model to measure employee’s behavioral expression in three ways; say, stay and strive. The assumption of this model is that those employees who feel engaged with the company will positively express these behaviors, for example, say good things or compliment the company to colleagues, potential colleagues and customer (Say), psychical contribution through harder-working (Stay) and high willingness to help the company achieve goals (Strive). Since 2015, the external survey is conducted biannually and observed that the engagement score declined gradually. To cope with the engagement issues, Employee Engagement Committee is appointed to drive improvement actions together with representatives from each functions. In addition, for continual improvement, CP ALL conducted in-house (pulse survey), which the methodology was developed based on Aon Hewitt’s model. Together, with these two methodologies, CP ALL was able to attentively monitor the Employee engagement feedback and improvement every year. Apart from the main projects, the Company also gives authority to each work unit to institute an internal working subcommittee. This arrangement opens up opportunities and realizes employees’ participation, through constructive environment for opinion exchanges. Activities are organized to further enhance engagement. The activities were organized by employees, for employees. Examples of the project from each work unit, operated in 2017, are: Fun with the Gang Project, and Full with the Gang, Tank with the Crew.